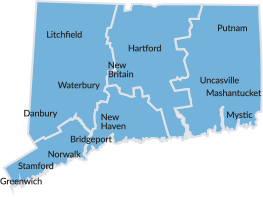 Looking for new things to do in Connecticut? From grand openings to getaway packages, restaurant launches to hotel upgrades, must-try experiences to not-to-be-missed exhibits, this is the place to discover all the new places to see, play and stay all over the state. On March 11, crafter brewer Two Roads Brewing Company will open a state-of-the-art, 25,000 square foot experimental brewing facility named Area Two. Area Two will be entirely focused on the production of sour, barrel-aged and experimental beers. It will also feature a tasting room, seasonal patio and rooftop beer garden. Bundle up and celebrate the first-ever Ice Festival coming to Mystic Seaport Museum, February 16-18. The festival will feature ice sculpting demonstrations, indoor sock skating, horse and carriage rides, an escape room, winter games, crafts, bonfires, live music and much more. Every year around this time, we make resolutions for the year ahead. Most of these promises to ourselves don’t survive January, but we’ve got 10 resolution ideas that can easily be accomplished next year, all right here in Connecticut. Make sure to include a few of Connecticut’s noteworthy museums to your indoor-activity plans this winter. From art and history to science and transportation – Connecticut has a museum for everyone to enjoy. To add to its growing number of lively destinations, Foxwoods’ is set to open a new Topgolf Swing Suite in the Fox Tower Casino. It will offer multiple golf simulator bays, throwback arcade games, a DJ booth, lounge seating and a full-service craft bar with an impressive food and drink menu. Explore Mystic Seaport Museum’s newest exhibit: ”Death in the Ice: The Mystery of the Franklin Expedition,” on display from December 1, 2018 – April 28, 2019. The exhibit features expedition materials from London, Inuit culture and knowledge that led to the wrecks’ discoveries, and unique artifacts seen for the first time in 170 years. Embrace the cold weather this winter and holiday season in Connecticut, where an adrenaline-pumping adventure, cozy bed and breakfast, holiday festival and fireside meal are never too far apart. The holiday season is upon us and if you’re on the hunt for the perfect Christmas tree, then check out any of these tree farms and activities to make this year’s experience memorable. Did you know that 7.2 million vacation days go unused in Connecticut? Don’t let yours be one of them. Take more of your hard-earned paid time off by discovering new places and activities, right here in Connecticut.